At Althorp, the Spencer-family estate in Northhampshire, England, you'll find sprawling acres of green, picturesque views and splendid architecture. But over the past 12 years, what people have found to be most appealing about the aristocratic family's grounds has been the burial site of Princess Diana. Her final resting place is said to be on an island in the center of a lake called Round Oval. From the lake's edge you can see an urn but not a headstone or a grave site. Once a year, between July and early September, visitors are allowed to visit the shrine near the island (pictured)  but no visitors are allowed to set foot on the island itself. 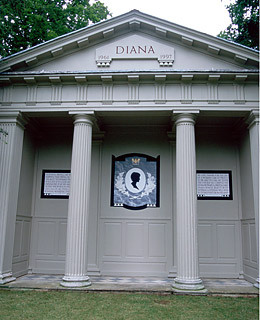 Read "10 Years On: Why Diana Mattered."